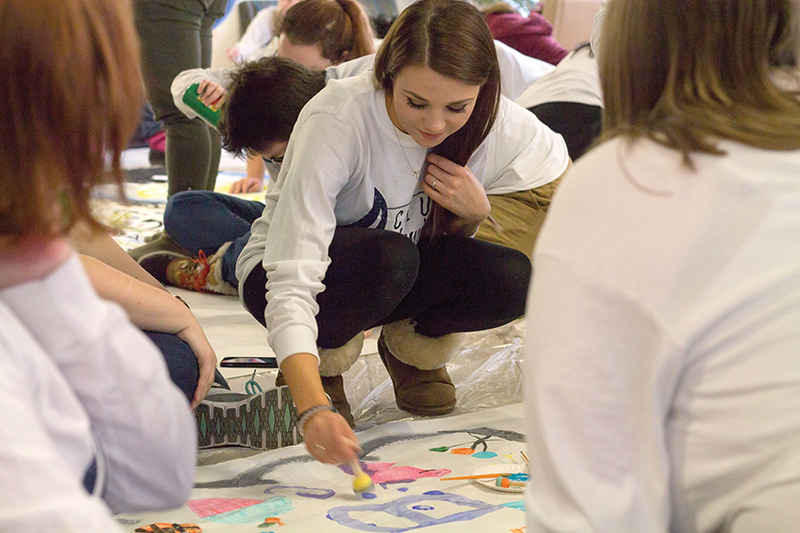 Senior education major and treasurer of the Future Educators of America club Stephanie Galbraith paints her club’s mural during the SAIL Club Showdown mural competition on Monday Jan. 25, 2016 in the West Penn Lobby. 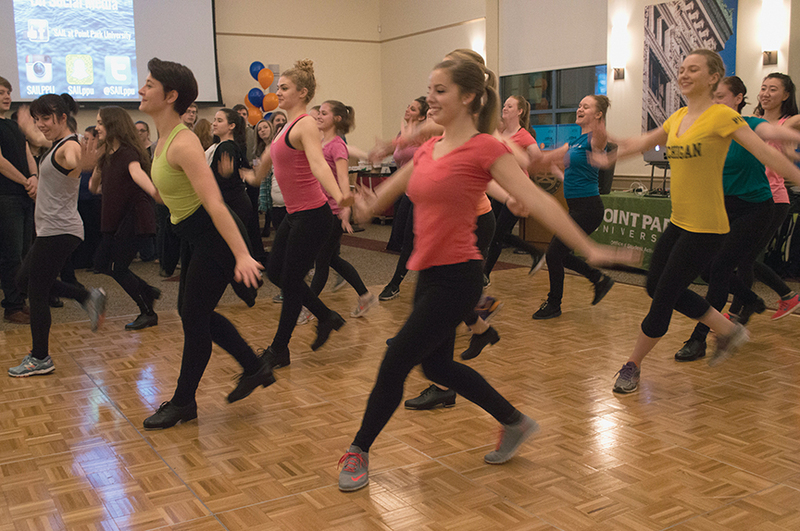 Students packed the Lawrence Hall multi-purpose room on Wednesday, Jan. 27 for an evening of performances by dancers, martial artists and Point Park’s own improv troupe. The event capped off three days’ worth of club-centric events and competitions organized by the office of Student Activities, Involvement and Leadership (SAIL). The idea for the “SAIL Showdown” came from an unlikely source. 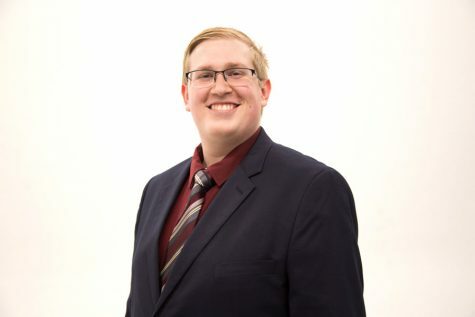 Shipley said that the showdown was aimed to build a community between clubs and to make students aware of the active student organizations on campus. “This is an entire week that’s meant to advertise our clubs, get out there what it is that they (the clubs)do so that they can gain new members and also showcase their talents because I think what’s really important in community building is that we know what each other is good at and that we can congratulate each other and really work with each other on building up that community,” Shipley said in Lawrence Hall Wednesday. 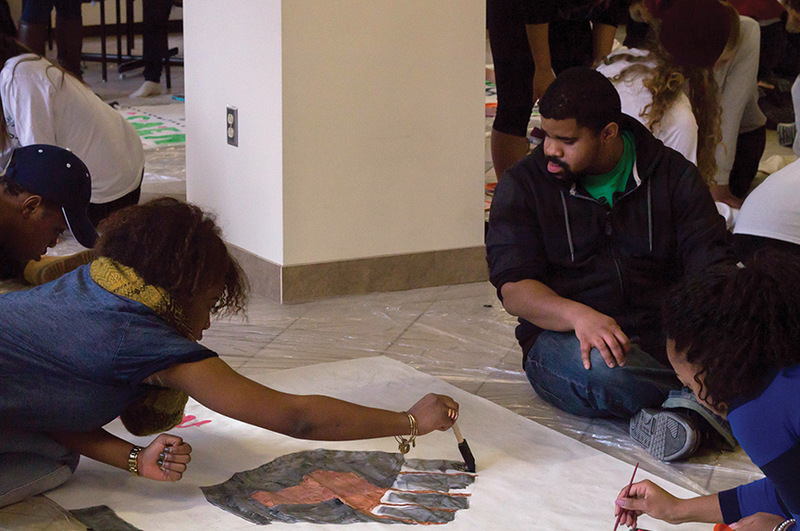 On Monday Jan. 25, clubs created murals which have been hanging in the entryway to the Student Center. Each mural was to provide a visual representation of what the club’s goal is on campus. Students then voted for their favorite mural. On Tuesday Jan. 26, clubs competed in an online and campus-wide scavenger hunt, reporting their findings via social media. Tuesday also brought the ‘Mark a Member’ competition. 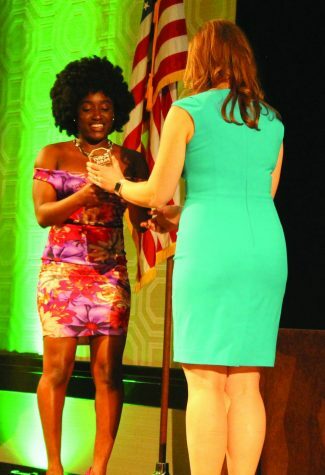 The events wrapped up with closing ceremonies, where checks were presented by United Student Government President (USG) Blaine King to the winning clubs for use within their holding accounts. First, second and third place clubs received $175, $100, and $75, respectively. The winners were determined through a point system evaluating participation and performance. Shipley said that the point system was used, but clubs were judged holistically on participation. Funding for the execution of the event came primarily from the SAIL office, however, USG allocated $5,000 during their Jan. 18 meeting specifically for the event to cover the cost of t-shirts, prizes and other unspecified costs related to the showdown. “[USG funding] was used for the Moe’s Bar, which everybody seems to be enjoying. It was used for the photo booth and the DJ. 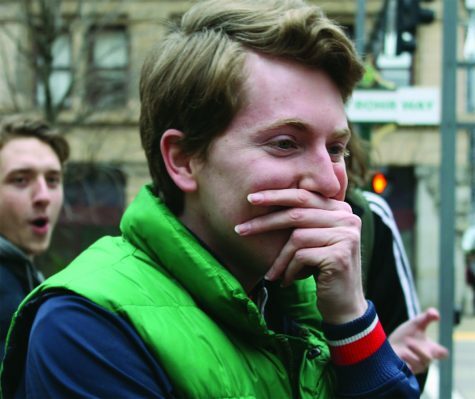 Almost everything you see here was assisted by USG funding, and that funding was pulled directly from the funds that clubs didn’t use last semester,” Shipley said. 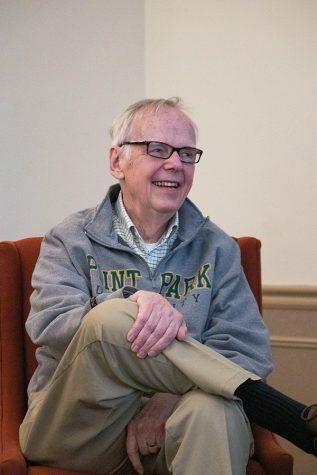 This was the inaugural year for the three-day event, and Shipley said she hopes to make it an annual tradition at Point Park. SAIL did have some bumps in executing the festivities, and for at least one event the measure of club performance had to be re-evaluated. Justina Cincotti, a work study at the Student Activities, Involvement and Leadership (SAIL), and Kate Shipley, the coordinator of student involvement, provided hot cocoa and coffee for students heading to class during SAIL’s Club Showdown on Wednesday, Jan. 27. Students could choose a club to support and get their sticker. Each sticker counted as a point toward the club’s overall score during the three-day competition. Law is the founder and current president of the pre-med club, which was awarded first place in the showdown. This is the first year for the club, which has about 30 members. To Law, the victory is not only for her club, but for awareness of her major. The continual adjustment with which SAIL approached the execution of the events seems to have paid off. Between 10 and 12 clubs participated in the events, and the closing ceremony was attended by upwards of 200 people throughout the evening. 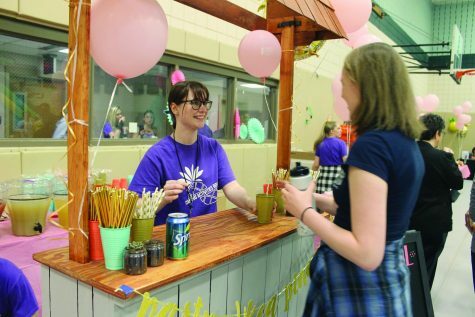 “This [closing ceremony] obviously is packed right now – I think [overall this week has had] good attendance,” junior Jess Joseph, the media representative for Impulse, said. 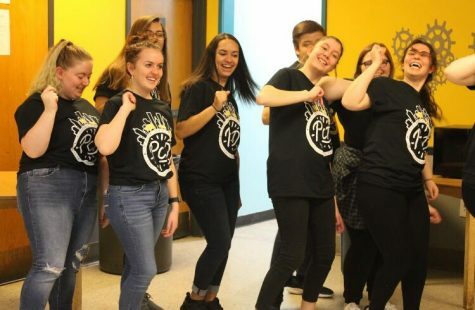 Joseph said Impulse, a campus club and dance troupe, participated throughout the week and was excited to perform as a part of the closing ceremony. Students from dance club hit the dance floor between club presentations at the SAIL Club Showdown Awards Ceremony. 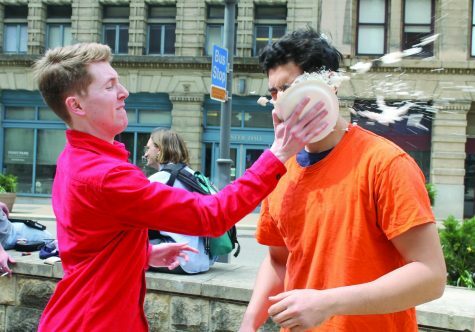 According to Shipley, that was the point of the whole week – to bring awareness to the active clubs on campus and to build bonds between those clubs. Larger-than-expected attendance at the closing ceremony confirmed for SAIL the viability of the program. 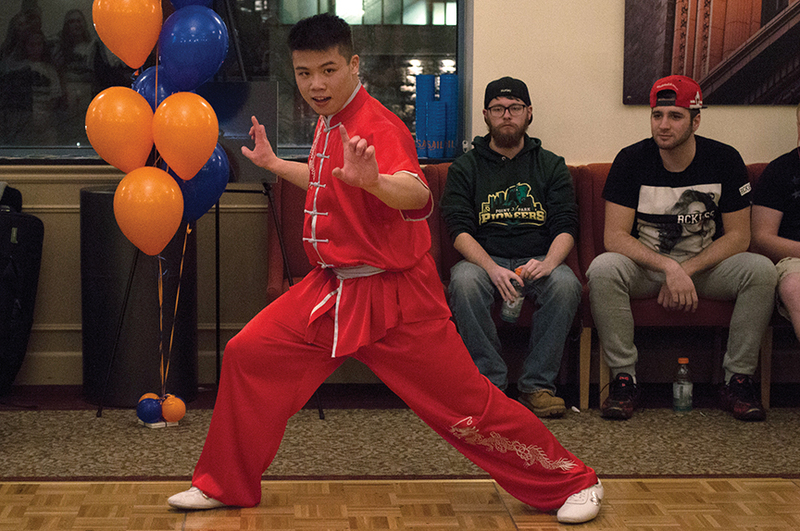 Albert Ho, sophomore criminal justice major, shows off his martial arts moves at the SAIL Club Showdown Awards Ceremony Wednesday Jan. 27, 2016. 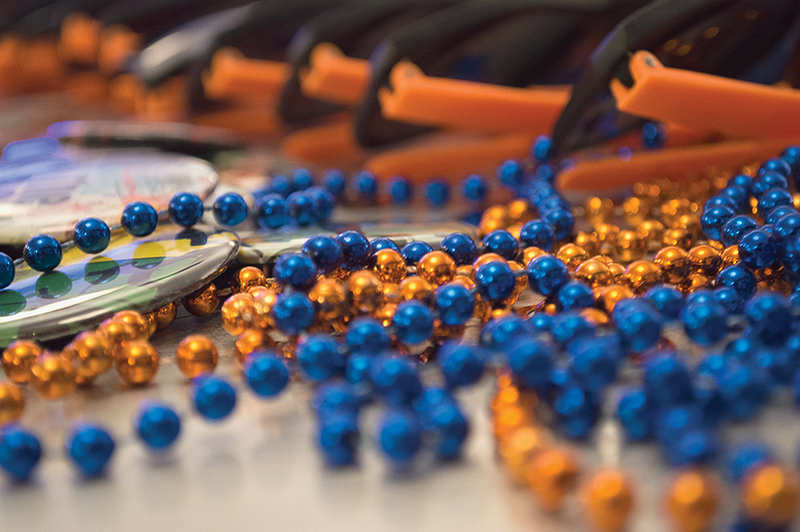 Decorations of bead necklaces, club-themed pins and SAIL official sunglasses at th SAIL Club Showdown Awards Ceremony Wednesday Jan. 27, 2016.